For many experienced table game players, online live casino games are the only option that truly recreates the feeling of playing in a real land-based casino. But for those who use cryptocurrencies to gamble online, live casino games were something unattainable for a long time, up until a while ago when the first Bitcoin live games were made possible. And now, playing a classic casino game against trained dealers has become even more attainable, thanks to mBit Casino. Namely, the popular Bitcoin casino operator has now made it possible for any user of “alternative cryptocurrencies” (altcoins) accepted by the site to place a wager on professional live dealer games. mBit Casino was one of the first licensed Bitcoin casinos to surface on the web. 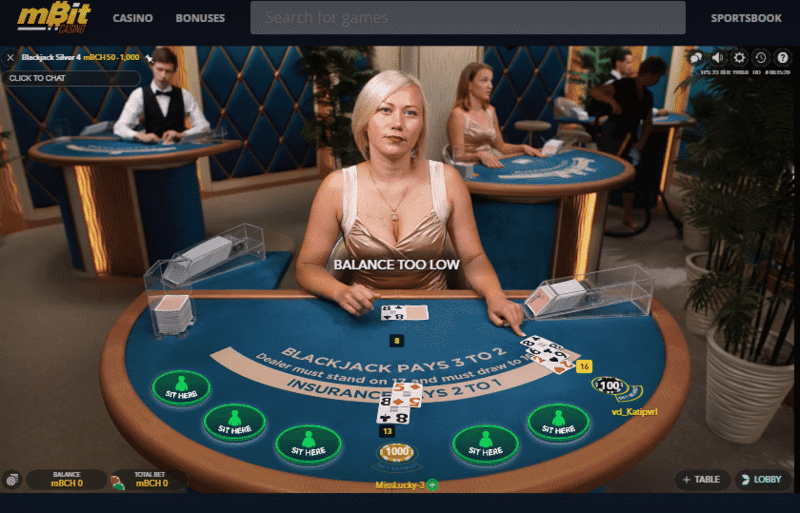 Since its inception in 2014, the site has been making great efforts to build its online platform into a full-blown gambling hub that’s capable to cater to any player need. 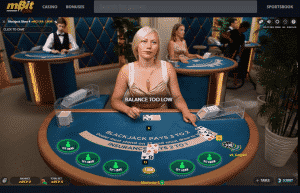 The casino’s live dealer offer has been particularly loved by Bitcoin casino players, thanks to mBit’s marketing stunts like the photoshoot of its dealers in lingerie as well as the record 260 BTC win that was hit during a live session against the casino’s dealers. This week, mBit casino adds yet another hallmark in the Bitcoin gambling industry by becoming the first BTC casino operator to offer live games that can be played with altcoins. The whole deal was made possible only with the help of the casino’s long-lasting partnership with leading live game providers Evolution Gaming. Currently, the casino is offering live games for players who prefer to use Bitcoin, Ethereum, Bitcoin Cash, Litecoin, Dogecoin, and Euros when gambling. These altcoins were first introduced at the start of 2018 in order to provide players with more alternatives than Bitcoin in a time when the leading cryptocurrency suffered congestion and slower payments due to its popularity. At first, they were only available to players of slots and virtual table games but now they can be used almost anywhere on the platform. Evolution Gaming has become a household name with live casino players thanks to the studio’s diverse range of options that can fit any player budget or taste. The strongest asset of the live game provider is its suite of 30+ Blackjack tables which can be played with as little as 0.10 mBTC. In this big game portfolio, you’ll find both classic version of Blackjack as well as more casual options like Blackjack Party. Another game Evolution Gaming is well-known for is Baccarat, which can be played in speed, squeeze, and control squeeze variants at the casino, with beautiful live dealers dressed in red Asia-inspired outfits. But if that’s not your game of choice either, you can also find Casino Hold’Em live games and Roulette variants like French and Immersive Roulette inside Evolution’s live lobby. For a full list of live tables available for BTC, BCH, LTC, ETH, and DOGE wagers, you can visit mBit casino.